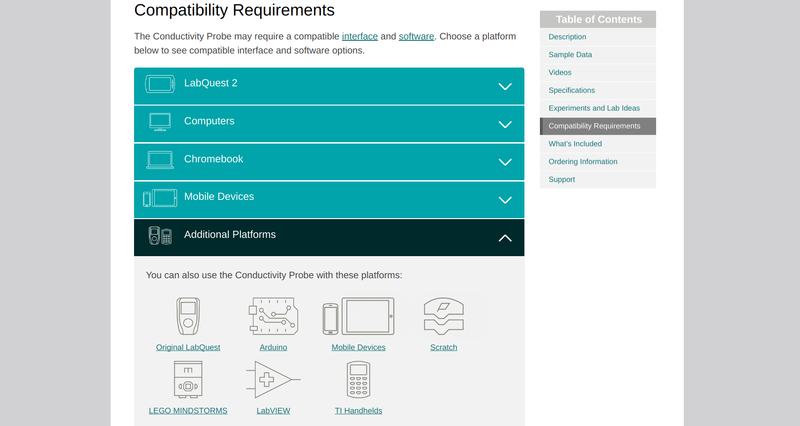 To make it easier to connect a specific sensor to any datalogger, let's go through the big list of sensors and add information about compatibility. There's a huge list of sensors organized by type on the Water Sensors page. Vernier sensors list compatible devices under Compatibility Requirements, but their site is more helpful than most. We're hoping for Arduino compatibility. Or, if you see something like "USB + Bluetooth", add that. Some sensors have a proprietary interface and are not compatible with anything but the parent company's devices. That's good to know too -- mark that "Proprietary". If you're up to it, add a new entry to the Connecting Sensors section of the Water Sensors page, showing how to actually plug in and program the sensor!